Debra, Debbie to longtime friends and family, and Deb to newer friends and clients, came from a family of lawyers. Her father, sister, brother and brother in law are all law school graduates and attorneys. Anyone who knew her as a young girl could have told you she would be a lawyer. She did not believe it then, but everyone was right. Debbie graduated from University of San Diego School of Law in 1982. Immediately after passing the bar, she went to work at the Office of the City Attorney. After a few years as a prosecutor, she was approached by a family friend, Bill Shifflet, to work for the firm then known as Shifflet, Sharp & Walters. The move brought her from criminal prosecution to civil litigation, where she would spend the rest of her career. After rising to a partnership at the Shifflet firm, she struck out on her own, ultimately joining with her father, George Hurst, as Hurst & Hurst. 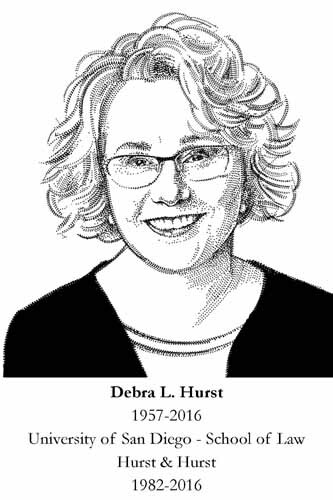 When George retired in 2005, Deb continued to practice as Hurst & Hurst until her death. The awards she received were in keeping with her preeminent trial skills and innovation. Debbie was honored as Trial Lawyer of the Year and was twice named Outstanding Trial Lawyer by the Consumer Attorneys of San Diego. The California State Bar awarded her for legal service and excellence for being the first California lawyer to apply the salary based test for employee exemption to part time employees in a class action against United Parcel Service. She was a member of the American Board of Trial Advocates. And of course for her clients she won multiple million dollar settlements and verdicts in cases ranging from consumer fraud to wage and hour class actions, from medical malpractice to personal injury. All won with the ongoing respect of her adversaries. While law was her profession and calling, her passion was show horses. With an active trial practice, she found the time to compete in equestrian competitions around the country. She owned and showed five world champion Morgan horses and was very active in and an advocate for the Morgan and Saddlebreds breeds. With her daughter Tayler, she travelled from California to Massachusetts and most states in between for horse shows and made friends in the horse world from coast to coast. Numerous publications mourned her passing and the loss to the sport. She was the proud mom of her two children, Tayler and Matthew, and their successes. She was proud of her successes in court and the horse show arena, but always made sure to give credit to those who helped her succeed. Her associates, trainers and friends all shared in her success. All done with a quiet dignity that hid how hard she worked to succeed.